During the period Chumpon will do performance Art and talks everyday ; solo and invite the guest artists to work with him. Chumpon Apisuk, studied art at Changsilpa School of Fine Arts, Silpakorn University and The School of Museum of Fine Arts, Boston, Massachusetts, USA. He also studied art with Tang Chang during the year 1968-1970. Chumpon found Concrete House, and Art and Community Action Center in Nonthaburi, north of Bangkok in 1993. The Concrete House is the first art center which open specifically for performance art in Thailand. As an artist, he is one of the pioneer in performance art in Thailand, and still actively perform throughout the world. He has been active in promoting performance art in Thailand since 1985, when he was working as an assistant to the Director of Bhirasri Institute of Modern Art, in Bangkok, where he organized a multi-disciplinary live event called Wethi-Samai (Contemp-tre). He is considered the founder and has laid the ground for performance art in Thailand. 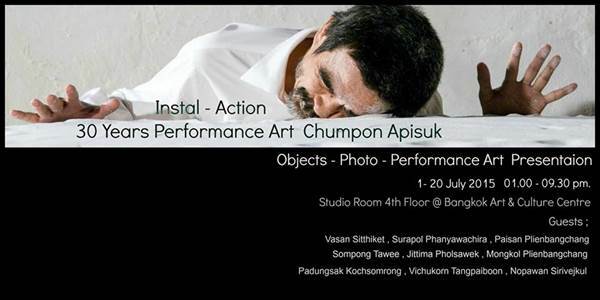 Chumpon Apisuk found Asiatopia International Performance Art Festival in Thailand in 1988 and still a director of the festival. For more than 30 years he has been invited to teach, lecture and perform in many countries, around the world.